Very simple rules: Just post a game other than Icehouse but with the image being that pieces, mechanics or rules they are easy to adapt to Icehouse. Here you have an excellent collection of even more excellent Adaptations for Icehouse games. In a game of „Dicke Daemonen“ the players are magicians trying to rule the world. Curiously this is a small world indeed because in the eyes of a magician the world consists of magical power lines and power fields only. Three Musketeers is played on a 5 x 5 square grid board. The bottom left corner, the center and the top right corner are starting spaces for the three musketeers. All other spaces are initially occupied by "enemies." Musketeers can only move to adjacent spaces with an enemy piece, which is captured by this move. Enemies can only move to empty adjacent spaces. Enemies win if all three musketeers are ever on the same line or column. Musketeers win as soon as they run out of legal moves. Published in Sid Sackson's book "A Gamut of Games." 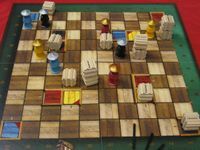 Designed to use the same board and pieces provided in a standard Chess set, Arimaa is the first game created intentionally to be difficult for computers to play. The number of possible moves at each turn in Arimaa is almost 1000 times that of Chess. There is a reward of $10,000 for the first person or company that can build a computer program that can defeat a selected human Arimaa player prior to 2020. 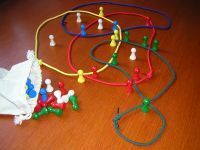 The complete rules of the game are available at the http://www.arimaa.com/ website where visitors can also play the game online with others. StreetSoccer is the name in the Netherlands (Dutch: Straatvoetbal) for how soccer is played in parks or squares in cities and villages. In this game 2 StreetSoccer teams play a 25 'minute' match. The soccer field is 10 spaces long and 6 wide (plus spaces outside the lines). The 2 players of this game both are coaches of one team. Both coaches have 5 StreetSoccer player figures (incl. the goalie). A die determines your number of spaces to move one of your figures. If you reach the ball you shoot the ball by the unused number of pips on the die. The die makes luck a part of this game. But your choices, like which player you move to which field and where to pass the ball are very important. For the following turns you calculate chances for your opponent and yourself and you try to have your players in good positions for later situations. Two players, Black and White, alternate placing tokens on the board. After all the tokens are on the board, they can be moved to any adjacent, empty square. The player wins who first gets her pieces in a winning configuration: either a straight line (in any direction) or a close-knit square. 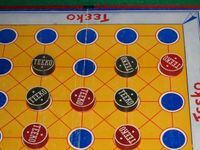 "Teeko is the first really new all-skill board game since the invention of Checkers 8,000 years ago. One of the greatest gratifications of my life was the invention and perfection of Teeko, a game I labored 27 years to perfect. 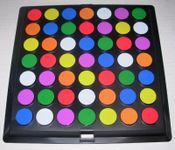 I firmly believe that Teeko will some day replace Checkers as the number one all-skill board game throughout the world." Allegedly such well-known people as Humphret Bogart, Lauren Becall, Joe DiMaggio, and Steve Allen were devotees. 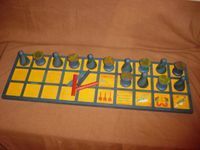 Senet (or Senat, also called the game of 30 squares) is an ancient Egyptian board game for which no rules have survived, although many boards and pieces have. 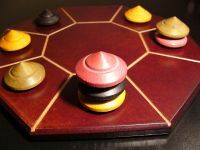 While no one is sure how it was played, it is generally assumed to have been a race game, played by two players moving five, seven or ten pyramids in an inverted S curve around the board. An Abstract from Bruno Faidutti. It is really pretty good. Will need 12 pyramids (3 of the same size in four colors). 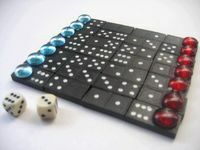 On a 7x8 board made up of randomly-chosen dominoes, players attempt to move all seven of their pieces to the other player's side of the board. 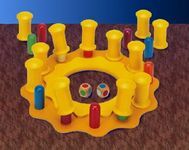 The number of spaces a player can traverse during each turn is determined by his roll of a die, his opponents previous roll, and the difference between the pips on adjacent spaces of the board. Cross Currents appeared in the August/September 1989 issue of Games Magazine. Djambi, or Chess of Machiavelli is a game for 4 players that can be played with only 3. There also exists a 5-player version called Pentachiavel. It's a game for two players. On a 9X8 checkered board they must move their colored pieces (4 blue, 4 yellow and 4 red) to capture their opponent's pieces; but during the game for every enemy piece captured, you have on the board one new piece of a complementary color (orange, green or purple. From then on what you can capture and with what is decided by a complex color chart. When a complementary color is captured, you can obtain a new black piece (the chameleon)with special rules. 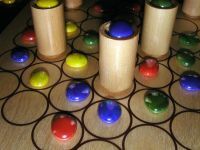 The game contains a forest of wood: 6 “light spectrum” large cubes in different colors and thirty smaller pawns, 5 each in six different colors that match the larger cubes. There are also fifty cards that determine the movement of the pawns and cubes, a cloth bag in which to place the pawns and a board onto which the cubes and twenty of the pawns will be placed. To begin the game, the six large cubes are arranged randomly on the spaces provided in the center of the board. Then, the thirty pawns are mixed inside the cloth bag. 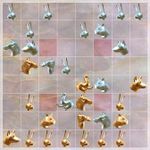 Twenty pawns are drawn randomly, with ten being placed on each side of the board. Each player is then dealt five cards. The objective is to arrange your ten pawns in the same color sequence as the six large cubes. The game ends when the first player accomplishes this task and victory points are earned for a variety of accomplishments. Oshi, which means “Push,” is inspired by a Japanese legend in which the Goddess Amaterasu gifted the first Japanese emperor with her ancient wisdom, in the form of a game. The game is said to have taught the emperor and his court to temper their influence and power with caution. The goal is to be the first player to push seven points worth of your opponent’s game pieces off the board. Each player begins the game with eight game pieces shaped to look like one-, two- and three-story Japanese buildings. The number of stories a piece has equals the number of spaces it can move, the maximum number of other pieces it can push and the number of points it is worth if pushed off the board. Pieces move side to side and forward and backward. SiegeStones is an exciting game of abstract strategy Players take turns placing pieces (either stones or towers) on the board. Stones threaten towers, controlling them. Towers weaken stones. There are 9 towers to vie for. You only need to control 4 to win, and you have 20 stones to do it with. Can you take the towers? This cute little game is about Indians trying to keep the village from being overrun by buffalo. One player is the Indian chief with his dogs while the other player is a herd of rampaging buffalo, all well represented by nice little wooden pieces. Each side has its own style of play as the pieces move differently. Fragile was designed by Czarne, who also did the graphics for it. A whole slew of crates have arrived at the wharf in Shanghai. Now, this highly fragile cargo must be brought to safety in one's own warehouse as quickly as possible. Problem is, the warehouses are all over the place. Plans are perpetually sent askew, since foreign Chinese workers will often push your crate out from under your nose. Each player controls a team of Chinese workers. Who will be the first to use his team to fill his warehouse with crates - that is, get the most points for fragile cargo? Fragile will please the mind and eye of any strategist. Abstract strategy game for 2 players. Players try to capture the opponent's Damyo with their own Damyo or one of their 5 Ronins. 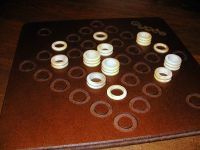 Game contains one 6x6 Leather Board (12 single spaces, 12 double spaces & 12 triple spaces), 2 Damyo (one for each player) and 10 Ronin (5 for each player). 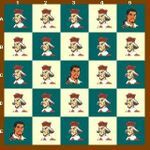 You play Pacru on a board consisting of a grid of nine tiles by nine tiles, divided into nine "borderlands". The game centres on the interaction between pieces (four each) and tiles. 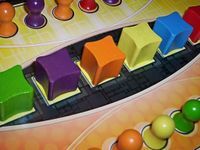 The board starts with neutral tiles in each position and as the game progresses you replace the tiles with your own colour by moving across borders. As you gain more tiles in a borderland, so your pieces there gain more power of movement. 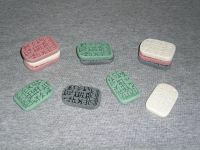 Using a connection change you can sweep a piece across the board changing tiles to your colour, or with two pieces you can pincer an opposition piece. You win the game by placing your 42nd tile on the board, or by eliminating all your the opponent's pieces. 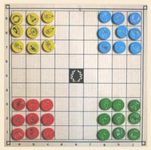 The object of Shacru is to acquire as many squares of your colour on the board as possible before the game is over. The board is a 9 by 9 grid divided into 9 borderlands of 3 by 3 squares (could now be mistaken for Sudoku! ), and at the start of the game all of the squares are neutral (not coloured). Azacru has one objective: to have as many squares of your color on the board at the end of the game. There two very different dynamics at work in the game. Since you cannot land on a square of another player's color, part of the game focuses on blocking opposition pieces and avoiding being blocked. However the game features a "connection change" move which involves pre-planning so that you can move one of your pieces several squares across to another square already of your color. Potentially this could be right across the board, which is a 9 by 9 grid. A brilliant abstract game. 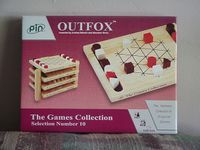 The object of the game is to move a piece to your opponent's last row. The catch is, no one owns the pieces. You can only move a piece in the row nearest you. Pieces are made up of 1, 2, or 3 rings. This number is also the number of spaces it can move. If it lands on another piece, it can move the number of spaces equal to this pieces number of rings. It can also displace that piece with the piece landed upon placed onto another space. Played with tournament rules, you cannot win on an opponent's mistake, but rather, by creating a situation where your opponent cannot block multiple winning combinations. Required: 2 icehouse sets + 4 Martian Coasters. Outfox is an easy-to-learn game with a twist. The goal is to form a row of three pieces, either three sizes in one color, or one size in three colors. The twist is that as each piece is placed the piece next to it must slide to a new position. The board for this 2-player game is a 6x6 board composed of movable 3x3 sub-boards. The rules are very simple -- place a piece of your color on an unoccupied square, then choose any one of the 3x3 sub-boards and rotate it 90 degrees. If any 5 of your placed pieces are in a row (orthogonally or diagonally, you win). Required: 4 Martian Coasters sub-boards and 18 pyramids of each colour. There are 12 yellow blocks each hiding a colored rod underneath it. These rods are in six colors, two to each color. On your turn, roll two dice, which will give you two colors at random. Reveal two blocks; if they are of that color, move it to your scoring pile. The interesting twist here is that you can reveal any blocks, including those that are in a score pile. A pleasing combination of puzzle and strategic game. On one side of the board, the idea is to place 14 tiles so as to cover all but one of the 7 colors. There are 7 colors and therefore 7 different problems. On the other side of the board, the game consists in seeing who of the two players is able to play more tiles. 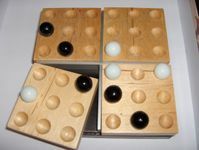 Diam is a game of strategy for 2, 3, or 4 players. 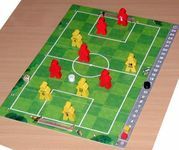 The simplicity of the rules and the depth of play will satisfy players of all strengths and all ages. The goal of the game: to place 2 pawns of identical color at the same height on 2 diametrically opposed spaces.